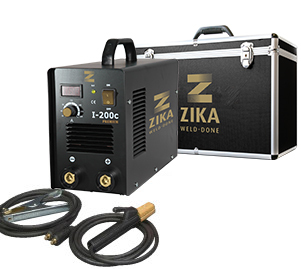 Welding and cutting Machines - I-200c – Zika Industries Ltd.
Home Catalog Welding & Cutting Machines Stick Welders Welding and cutting Machines - I-200c – Zika Industries Ltd.
A professional welding machine with convenient dimensions for carrying. Comes in a rigid carrying case that is particularly durable, combining maximum convenience in carrying. The perfect welding machine for welders who conduct continuous welding work using electrodes of up to 4.0 mm size in the field of maintenance, pipe and general joining jobs. Allows for welding using a Z-610 electrode for quality pipe welds and aluminum welds using a Z-2805/Z-2812 electrode. May work with a generator of 10 Kva output. Suitable for pipe welding (Z-610). Lightweight and easy to carry,Rigidity, durability and warranty.